As the world celebrates International Women's Day on March 8, a local mother of two young children is hoping to get to the heart of the matter concerning women's health. 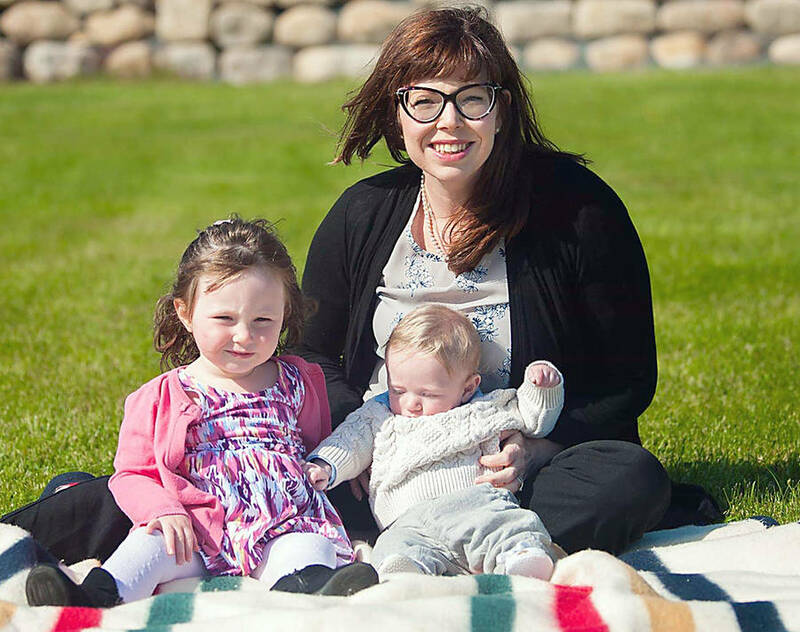 Nichole Nickerson of Middle LaHave experienced two heart attacks while she was in her early 30s, while her sister died of a heart attack at the age of 25. Now on International Women's Day, she hopes to be among a contingent of local health professionals and others encouraging women to give some thought to the physical health of their hearts. "We are really, really trying to just put the word out that women have heart attacks. We present differently. We are so more likely to be sent home from [a hospital emergency department] and it's either usually saying it's anxiety or something else," says the heart attack survivor. Nickerson is helping organize a Wear Red Canada Bridgewater event March 8 from 4 p.m. to 6 p.m. at the Atlantic Superstore, which was originally scheduled for February 13, to precede Valentine's Day, but which ended up being cancelled because of the severe weather that swept across Nova Scotia on that day. "We really need to raise awareness for women to be their own advocates," she says. The event is part of a national campaign organized by the Canadian Women's Heart Health Centre in Ottawa during which women across the country were encouraged to wear red clothing and hash-tag HerHeartMatters. Similarly, the event in Bridgewater is designed to raise awareness of women's heart health. Nickerson hopes to have a dietitian offering a selection of heart-healthy food options; Emergency Health Services representatives on hand to take blood pressures, and representatives from Heart & Stroke and Diabetes Canada. The event comes on the heels of the release of the Heart & Stroke Foundation's 2019 report which echoed earlier findings indicating that "women in Canada are under-researched, under-diagnosed, under-treated, under-supported during recovery and under-aware of their risks." However, this year the report went on to detail ground-breaking research into the connections between heart conditions, stroke and cognitive decline. "A new in-depth analysis, conducted by Heart & Stroke, of the interconnections between our hearts, our brains and our minds has revealed that the relationship is much stronger and more complex than previously thought, and the impact of the connections on the already overloaded health system - and on people's lives - is profound," the foundation suggested in a news release. Heart & Stroke reports "notable differences" between men and women, showing that women are "at even greater risk than we previously knew." According to the report, women with heart failure have a risk six times greater than men of atrial fibrillation (Afb), an irregular and often rapid heart rate that can increase risk of stroke, heart failure and other heart-related complications. Those with heart valve disease have a 50 per cent greater risk of Afb than men, while 45 per cent more women die of stroke than men in Canada. And in 2016, 12 per cent more women than men died of heart conditions, stroke or vascular cognitive impairment. Nickerson believes her and her sister's heart issues were genetic - their parents had both had heart attacks before the age of 40. However, she admits she was "no saint. I mean, I know that a lot of this was hereditary and this was going to happen to me regardless. But I did not do my body any favours. "I was a smoker. I didn't eat the best, definitely didn't exercise." Shortly after her sister died unexpectedly of a cardiac arrest five years ago, Nickerson decided to get herself checked. She underwent - and passed - a stress test and ECG at the South Shore Regional Hospital in Bridgewater. "As far as they knew, everything was fine." A month later she went to the hospital's emergency department complaining of chest pain, and her blood pressure was up. She says she was given a prescription for medication for Gastroesophageal reflux disease (GERD), or heartburn, and claims she was told "'it's impossible for you to be having a heart attack. You just passed the stress test a month ago.'" Nickerson notes that women and men often don't have the same symptoms as men in a heart event. "I never had the classic heart attack. I never had the clutching my chest, throwing up, passing out. I never had any of that," she recalls. She explained her symptoms were more like a pressure underneath and in between her breast bone and at the top of her stomach, and "really bad heart burn," which would come and go. When the condition didn't improve, a family friend, who is a retired emergency nurse, encouraged her to return to the hospital. That trip ultimately ended up with her undergoing an emergency operation in Halifax to have a stent put in her heart to deal with a blockage. And while her first pregnancy with her daughter went off without incident, in January, 2018, she had another heart event shortly before her son was due to be born naturally. EHS Lifeflight flew her to Halifax, where she underwent a cesarean operation, followed by a heart operation to put in another stent. Nickerson says she takes what happened to her "really seriously," and that her lifestyle since has changed a lot. ""We eat really, really healthy. We try to eat a plant-based diet when we can. We make healthy choices. We try to promote that with our children. "I don't know if they're going to have my genes or my husband's genes. We're trying to give them every tool we can to give them a healthy start on life," she says. If there is one piece advice she would give women it's "listen to your body. "If you think there's something wrong, go get a second opinion, please, because it might just save your life," says Nickerson.